Is the Bible like "asbestos" in the public school? It is amazing that people today want to treat anything from the Bible as if it's asbestos (to borrow a line from Christian attorney Jordan Lorence) if it somehow shows up in a public school. Historically, it was the push to teach the Bible that gave birth to education for the masses in the first place. This was the forerunner to the public school. How ironic. A seemingly minor conflict in a small Texas public high school is symptomatic of a major conflict in society at large. 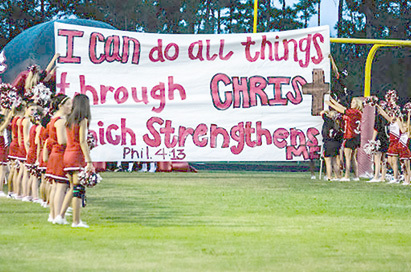 Specifically, can cheerleaders in a public school adorn banners with Bible verses? The Freedom From Religion Foundation based in Wisconsin says no – and filed a complaint to censor such banners. But Liberty Institute based in Texas says yes. The case began in Kountze, Texas – population, 2,123. On Friday, January 29, the Texas Supreme Court ruled in favor of the cheerleaders, 8-0. I spoke recently with Hiram Sasser, the lead attorney for Liberty Institute in the case, on my radio show. He told me that Justice Guzman's opinion provides support for the private beliefs and speech of the cheerleaders. Sasser said that the cheerleaders at Kountze are "a private student club." They buy their own uniforms and materials. With their money, they pay for the banners and the paint to adorn the banners with uplifting messages from the Bible. For example, they have a banner with Paul's exhortation (Philippians 4:13): "I can do all things through Christ which strengthens me." They prefer to have uplifting messages, rather than the typical "Kill the Tigers"-type cheerleading banners. To Sasser, the essence of the case is that the cheerleading students were losing their free exercise of religion rights guaranteed in the Constitution. But doesn't this violate the establishment clause? Sasser told my listeners, "The establishment clause regulates government speech – when the government is speaking. That is when the establishment clause applies....But when it comes to private speech, the establishment clause doesn't even apply....Private speech has an affirmative protection under the free exercise clause." He added, "Then the only question is whether the government is allowed to censor speech because it's religious. Thankfully, the U.S. Supreme Court has answered that question four different times over the past twenty-five years...It is unlawful censorship and no, the government may not censor speech simply because it's religious." But religion, and especially Christianity, is often discriminated against today by administrators and teachers in the public school system – some of whom, perhaps, think they're upholding settled law. What Sasser pointed out is that settled law, as seen in Supreme Court decisions, consistently upholds the free exercise of religion rights of students. Religion is not being "established" when little Johnny says his grace at his meal, even in the public school cafeteria. Rather, it is unlawful to prohibit him from doing that. The Freedom From Religion Foundation began this case. Now the ACLU is continuing it. They will likely appeal, as they represent the school district which has dug its heels in and is trying to disallow the banners. That is to say, the ACLU and the school district are engaging in what the Supreme Court said is censorship. But who cares about cheerleaders' banners in a small town in Texas? The world is on fire. We have a huge election campaign underway. Well, this case is important because it gets to the heart of what we are as a society. The founders of America envisioned a self-governing people, for which morality was a precondition. That morality would come through the Bible, and through private, voluntary involvement in churches. John Adams, a key founding father, said it this way, "Our Constitution was made only for a moral and religious people. It is wholly inadequate to the government of any other." The founders recognized freedom of religion. What groups like the Freedom From Religion Foundation wants to mandate is, as their name explicitly suggests, is freedom from religion. As we consider who to vote for in the primaries, especially for president and for senators, we must consider the issue of judges. The whole anti-Christian campaign of the last fifty years in America was brought on in large part through judges. The president appoints our federal judges. The senate confirms or rejects them. As you go to the poll, consider the question: What types of judges would the candidate choose? That is a huge issue. The Supreme Court once ruled, "It can hardly be argued that either students or teachers shed their constitutional rights to freedom of speech or expression at the schoolhouse gate" (Tinker v. Des Moines, 1969). That remains true despite the persistent efforts of anti-Christian groups to treat the Bible like asbestos in the public school.